We recommend this Agile Master Certified course for businesses that are beginning to, or plan to implement agile thinking. Over 3 days, we will introduce your team to agile concepts and practices. This complete solution also includes access to our online study portal, and exam and international certification costs. Our goal is that each member of your team will leave with the confidence to begin implementing agile within your business, and to study for and sit the Agile Master Certified (SAMCTM) exam. When choosing a training programme for your team, you’ll want to know that first and foremost, they will come away with a working knowledge, and the ability to implement what they have learned. These are key objectives on this course. We combine practical and theoretical learning to give your team a well-rounded experience. 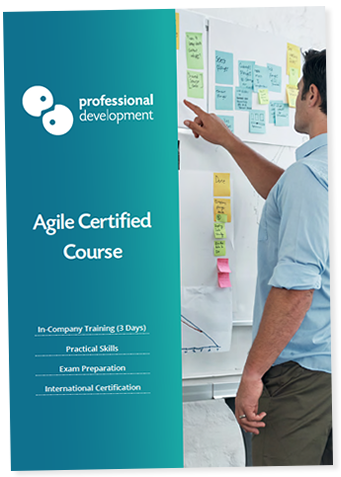 Successfully completing the study and online exam for this course will lead to the internationally recognised Agile Master Certified (SAMCTM) certification. Tailoring is a key benefit of in-company training. We will be delivering training exclusively to your team, and so can customise the content to be most relevant to your day-to-day processes and challenges. This is a full training solution from start to finish. We guide you through the planning and scheduling process, include focused classroom training, provide access to physical and online study materials, and incorporate both exam and certification costs. What Choose an Agile Approach to Project Management? Rapid changes in technology, market demands, and expectations have paved the way for conceptualisation and implementation of agile methods and values in many organisations. Agile relies on adaptive planning combined with iterative development and delivery. It focuses primarily on the value of people in getting the job done effectively. Although Agile began, and is still hugely popular in the software development sector, it is more widely adopted than ever today. The key qualities of agile project management make it relevant in every sector of business and industry. If you’re unsure as to whether agile will work for your business, why not get in touch with us? Our training consultants can advise on the best fit, and most effective project management approach for your needs. Do my team need experience for this workshop? No previous experience with agile is needed. This is an ideal introduction to agile project management. If your team have some experience with agile, we can tailor the content to address their experience level. How do I know if this is the right approach for my business, and my project managers? If your projects are often subject to changing requirements, or if the deliverables are difficult to define at the start of project work, agile could certainly be the best fit for your business project management approach. Talking with our training consultants about your challenges and priorities is the best way to determine its suitability for your team. Scrum is a subset of agile, a tool for implementing an agile approach to project management. We cover an overview of scrum processes during this course. I am not looking for group or in-company training. Can I attend this course myself? Yes, you definitely can attend this as Agile Master Certified training as a public course. We offer dates throughout the year. Click here to learn more about our public Agile Master Certified dates.